Saslic Face Wash contains 1% of salicylic acid. Salicyclic acid acts as a peeling agent that helps to shed of the top layer of skin to open up follicles that are clogged and are causing acne. It also helps in the growth of new skin cells, over all; it gives a skin which looks much fresher and younger. 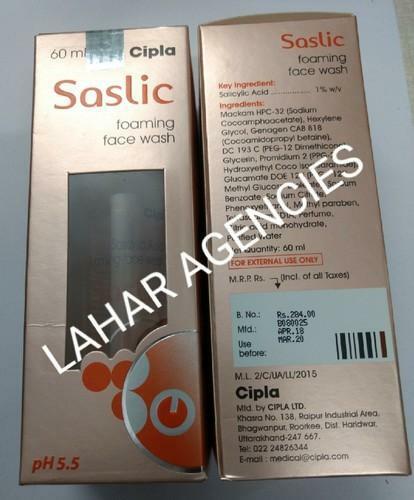 Saslic foaming face wash should be used as part of the daily cleansing routine for the treatment and prevention of acne for people with oily skin. Take approximately 1 ml of solution and gently massage the foam all over the wet face avoiding eyes and surrounding areas. Allow it to remain for 20 to 30 seconds. Rinse thoroughly and pat dry. Use twice daily. Established in the year 2007, We "LAHAR AGENCIES" are a leading Exporter, Distributor, Service provider of Pharmaceutical Tablets, Medicine Drop Shipping Service, etc. Further, we have a team of industry experts who hold years of experience in pharmaceutical industry. Our team includes highly qualified quality controllers, procurement agents, warehousing & packaging experts, delivery agents, etc. Moreover, we follow ethical business policies to be renowned in the domain.